Cities can be noisy. All you need to do to observe this is to go far away from a city. Spend a few quiet minutes in wilderness and you’ll certainly notice sounds, but you’ll also notice the absence of city sounds: garbage trucks, revelers at bars and restaurants, construction, barking dogs, airplanes and cars. Sometimes these are background noises to our lives. In other cases, these are the nuisances keeping us up at night. One noise I frequently hear complaints about is the sound of train horns. We live in a city with a significant amount of freight train activity and for those of us who live close to rail lines, we get a friendly reminder of this each time a horn is blasted. People often ask me about why do the trains make so much noise and what can be done to silence them. Why are there so many train horns? Train horn requirements are administered by the U.S Department of Transportation’s Federal Railroad Administration (FRA). In 1994, Congress passed a law that mandated the FRA to issue federal regulations that require train horns to be sounded at every public street-rail grade crossing. The impetus behind this law was that there had been a noticeable increase in train-vehicle collisions in states that banned nighttime train horns. In 2005, the FRA’s Train Horn Rule went into effect. The rule requires a train engineer to sound a horn at least 15 seconds, and no more than 20 seconds, before reaching a public grade crossing. The horns must follow a pattern of 2 long blasts, 1 short blast, and 1 long blast. The minimum sound level for a horn is 96 decibels and the maximum sound level is 110 decibels. In a city such as Portland where so much train movement occurs in areas where there are frequent at-grade street crossings, this leads to a lot of train horn noise. What can be done to silence trains? 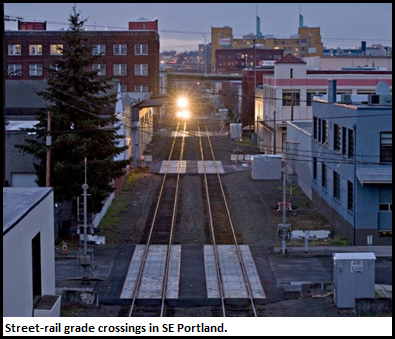 There are clear safety benefits to requiring trains to sound their horns at street crossings. There is also a strong desire by those impacted by train noise in Portland and communities across the country to silence the horns. One way that the FRA tries to balance these competing needs is through a process in which communities can apply to establish quiet zones. A quiet zone is a stretch of tracks – a minimum of ½ mile in length – where railroads are directed to not blow their horns when approaching at-grade street crossings unless in the case of emergency situations. This can extend for 24 hours or just for specified hours such as at night. A quiet zone can only be established when there are other safety measures at the crossings to make up for the silencing of horns. These measures can include specific types of crossing gates, medians that prevent cars from going around gates, closing crossings, and wayside horns positioned at the crossing. The process for establishing a quiet zone requires working with an alphabet soup of agencies. In Portland’s case, it involves the FRA, ODOT, PBOT, and the affected railroad companies. When the city puts a request in, these agencies then form a diagnostic team that evaluates the risk of collision between trains and vehicles at each crossing, as well as any necessary improvements that need to be made to deem the crossing safe for a quiet zone. After that, it is up to the local jurisdictions to go through the various bureaucratic steps to get federal approval of the quiet zone and to install the required safety equipment. Establishing a quiet zone sounds easy enough, right? The challenge is often twofold. First, it costs money. Installing safety equipment at at-grade crossings can cost anywhere between $30,000 and $1 million per crossing. With transportation budgets stretched thin, finding the necessary funding can be difficult, especially when talking about stretches with numerous crossings. Second, railroad companies are often resistant to quiet zones. They are concerned that quieting horns increases risks of collisions with vehicles and pedestrians. Working with railroad companies, many of which have corporate headquarters in other cities, is often difficult for local jurisdictions. Even with these challenges, Portland residents have had some success quieting train horns. A quiet zone has been established in the Pearl District, paid for by a combination of private and public funding. As part of the Portland-Milwaukie Light Rail project there have been safety improvements at crossings at SE 8th, 11th, and 12th avenues. The FRA is expected to designate these crossings as quiet zones in spring 2015. Quiet zones at a few intersections can be a benefit for those nearby, but they don’t go far enough for those who would like to see all of SE Portland a quiet zone. For something as broad as that to happen, our city would need to hear a different kind of noise. The noise of its citizens. The Oregonian: Hear that Lonesome Whistle? No? Good.